The Greater Cedar Mesa is renowned the world over for its scenic wilderness, coupled with an abundance of well preserved archaeological sites, ranging from jaw-dropping cliff dwellings to spectacular rock art images that inspire speculation about long-vanished societies. It is located in San Juan County in southeastern Utah roughly 45 miles west of the town of Blanding and 21 miles west-northwest of the town of Bluff. The area encompasses roughly 476,000 acres of broad, sloping mesas that are deeply dissected by narrow canyons at the southern end of the Abajo Mountains. These canyons lure tens of thousands of visitors annually, most of whom come to experience the archaeology that makes the region one of America’s greatest archaeological treasures. Variations in climate patterns undoubtedly influenced how humans adapted to an arid environment through time, and human responses to those changes are reflected by shifts in how the landscape was utilized and by changes in community structure, population size and group dynamics. But human responses were also very complex, influenced by both natural events such as cycles of drought, and by human factors such as alteration of the landscape through over-exploitation of pinyon-juniper forests. There is no doubt that populations expanded during optimal climatic regimes, and they diminished during bad cycles when the area was frequently abandoned. How the ancients responded to changing climates offer important lessons for modern communities in the Southwest grappling with limited water and burgeoning populations. Greater Cedar Mesa area constitutes a vast outdoor laboratory, much of it undisturbed, where scientists can study the human interactions with a harsh and unforgiving desert environment, and how those interactions changed through time. The ancients were highly flexible, adapting to change, sometimes with spectacular success, other times abandoning the area for better climes elsewhere. Archaeological studies into these changes through time offer tremendous potential to garner insights into the struggles of modern communities in the Southwest to cope with growing populations, the need to conserve water, and the impacts of climate change on our ability to grow enough food. Archaeologists estimate there are about 100,000 archaeological sites in the Greater Cedar Mesa area ï¿½ each site being a locality with remnants of past activities, from villages and kivas and cliff dwellings, to temporary camps and granaries and trails. Each of these sites is akin to a book in a vast library of information, each with important insights into past peoples and events. When a site is damaged, it’s as if pages are being ripped from the book, and information is lost forever. Archaeological sites are not renewable resources. Once a site is damaged or artifacts removed, irreplaceable scientific data is lost, and the ability of scientists to understand the lives of those who came before disappears with it. Vast areas of the mesa have never been formally investigated by archaeologists. 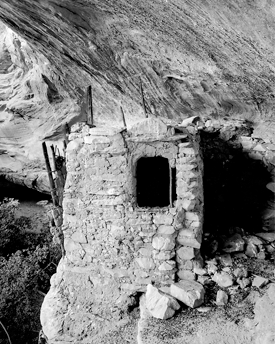 Major drainages with high numbers of visitors, such as Arch Canyon and the San Juan River corridor, have never been systematically examined by archaeologists. It is estimated that only 1 to 2 percent of the Greater Cedar Mesa area has been subjected to rigorous surveys. In effect, what scholars know about the prehistory of the area is based on a very small sample, and a more thorough examination could greatly alter our understanding of the human history of the region. If investigations in nearby Butler Wash are an accurate measuring stick, the density of sites in the Greater Cedar Mesa area could range from 80 to 90 sites per square mile. Such a high density would make the Cedar Mesa area among the richest archaeological districts anywhere in the United States. The archaeological importance of the region is enhanced by its wilderness nature that deters easy access to these sites. This helps to preserve the scientific information for future study. In effect, Cedar Mesa is a vast library of untapped knowledge, one largely protected by a rugged landscape. Beginning about 10,000 years ago, Cedar Mesa climates began to warm noticeably, and with the climate changes the vegetation began to change, eventually assuming the catalog of species now observed there, and the Ice Age mammals died out. Humans living here adapted to these changes, pursuing smaller game like deer and bighorn sheep, and harvesting wild grasses and seeds which they ground with stone tools called manos and metates. Archaeologists call these people the Archaic hunters and gatherers, who roamed the Four Corners area, following ripening of different plants and the seasonal movement of game. Evidence of there passing is rare and quite obscure. Only 28 Archaic sites have been documented in the Greater Cedar Mesa. Does this indicate the area was rarely occupied? Understanding hunting and gathering is critical to understanding the shift to farming at about 1000 B.C. 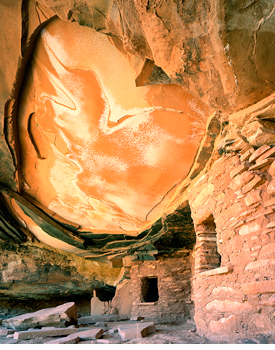 By the late A.D. 600s, the Cedar Mesa farmers were living in clusters of pithouses across the mesa top. At this time, a new technology appeared: pottery. Ceramic vessels allowed the farmers to more effectively store food and seeds, and permitted boiling of foods such as beans. A spectrum of broken pottery sherds fragments painted in black, white, red and orange, as well as plain graywares and corrugated types can be observed across the mesa and inside the many canyons. Unfortunately, these are frequently collected by visitors as keepsakes of their visit. Each fragment holds important clues as to the size and shape of the original vessel, trade networks, interaction among different family groups, and the relative importance of different foods to the local population. As the sherds disappear through thoughtlessness, so does important scientific evidence that could unravel the mysteries of Cedar Mesa. 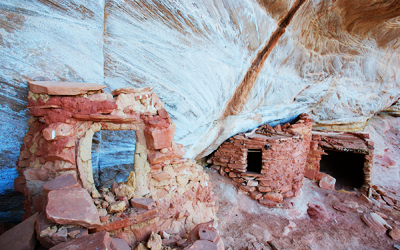 The remarkable preservation of the many cliff dwellings, towers and granaries so conspicuous throughout the Greater Cedar Mesa area has resulted in worldwide acclaim, drawing hikers, backpackers, equestrians and others to explore a relatively undisturbed archaeological paradise. Most of what the public comes to see was built by Ancestral Puebloans between A.D. 1165 and 1270 ï¿½ a period of time marking the death throes of ancient farming in the region. It is perhaps a bit ironic that the awe-inspiring ruins perched precariously on the cliff ledges represent only about 1 percent of the human history of the mesa. Most archaeological sites go unnoticed or unrecognized by visitors, many of whom are unknowingly damaging the scientific record by creating needless foot trails, driving across ancient sites now buried in the sand and pocketing artifacts for personal gratification. Archaeological sites in the Cedar Mesa region have been subjected to more than a century of official, unofficial and illegal excavation and removal of artifacts. Hundreds of alcove and cliff sites have been systematically looted, some of them over and over again over a period of decades. Efforts to thwart looters have been hampered by the vast nature of the canyon landscape and limited federal resources for law enforcement. It is assumed that most major sites in the Cedar Mesa region have been impacted to some degree by legal and illegal removal of cultural materials. This problem may be rooted in the past, but it continues today. The arrest in 2009 of suspected antiquities traffickers offers evidence that sites in the region continue to be damaged by illegal looting and vandalism. Roughly one-third of the sites in the area were in good or excellent condition at the time they were documented, with another third of sites being in fair or poor condition. However, the current condition of the vast majority of these sites is unknown. The lack of a systematic monitoring program for the region generally has made it impossible for land managers to gauge the nature or extent of site degradation over time at all but a handful of heavily impacted visitor attractions. Quite simply, managers perceive that increased visitation is adversely impacting the integrity of archaeological sites, but they do not know to what extent. The exploding popularity of off-road vehicles and the abundance of designated roads and trails throughout the Greater Cedar Mesa area are probably damaging and destroying large numbers of archaeological sites, either directly due to motorized travel through the sites or indirectly by providing easier and quicker access to sites that were previously protected by their isolation. Recent investigations of three designated routes in the area verified that vehicles are passing through, over and next to significant archaeological sites. Because these routes had not been surveyed prior to their designation, land managers had no idea these sites existed or that they are being damaged by ongoing vehicle use of the routes. 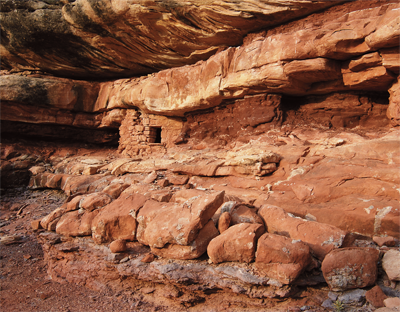 Given the vast majority of archaeological sites in the Greater Cedar Mesa area remain unknown to federal land managers, future efforts to preserve the cultural heritage of Cedar Mesa will require and unprecedented commitment of federal resources to identify and document these resources, and to devise new strategies to protect them for future generations. The greatest threat to cultural resources in the region is the crush of visitors who come out of genuine passion for the past, but who are loving the archaeology to death one visitor at a time. The BLM intends to apply a variety of proven strategies, including limiting group size, restrictions on camping and wood burning, and requiring vehicles to remain on designated trails. These approaches are based on a philosophy that limiting public access in archaeologically sensitive areas and implementing visitor outreach are the best tools to protect sensitive resources, discourage vandalism and encourage visitor appreciation of public lands. Actual implementation of the plan will be greatly constrained by federal funds that are actually earmarked for these purposes. in southeastern Utah, it is a religious symbol of their forefathers who traversed the mesa in 1880 to establish the community of Bluff. Their epic journey through the canyons of southern Utah and their almost inhuman determination to cross an impassable Colorado River gorge are a lasting testimony to their faith and perseverance. As such, it remains a clarion event in the history of Mormon settlement of the Four Corners area. Remnants of the trail are a source of honor to those whose ancestry can be traced to the Hole-in-the-Rock Expedition. The trail is listed on the National Register of Historic Places. is accompanied by appropriate federal funding earmarked specifically for management of this area. is a daunting challenge that will require an unprecedented commitment of federal resources to ensure their protection for future generations. In the past, the lack of funding has made it impossible for federal land managers to meet their management objectives related to Cedar Mesa.